Synthetic peptide conjugated to KLH derived from within residues 50 - 150 of Human hnRNP L.
Our Abpromise guarantee covers the use of ab45317 in the following tested applications. WB Use a concentration of 1 µg/ml. Detects a band of approximately 65 kDa (predicted molecular weight: 60 kDa). This protein is a component of the heterogeneous nuclear ribonucleoprotein (hnRNP) complexes which provide the substrate for the processing events that pre-mRNAs undergo before becoming functional, translatable mRNAs in the cytoplasm. Is associated with most nascent transcripts including those of the landmark giant loops of amphibian lampbrush chromosomes. Associates, together with APEX1, to the negative calcium responsive element (nCaRE) B2 of the APEX2 promoter. Several isoelectric forms of the L protein are probably the results of post-translational modifications. Nucleus > nucleoplasm. Cytoplasm. Localized in cytoplasmic mRNP granules containing untranslated mRNAs. 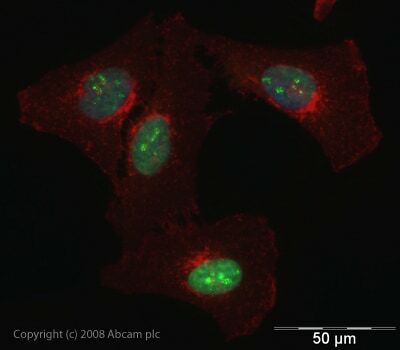 ICC/IF image of ab45317 stained human HeLa cells. 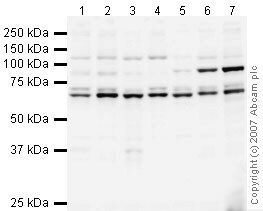 The cells were PFA fixed (10 min), permabilised in PBS-T (20 min) and incubated with the antibody (ab45317, 1µg/ml) for 1h at room temperature. 1%BSA / 10% normal goat serum / 0.3M glycine was used to quench autofluorescence and block non-specific protein-protein interactions. The secondary antibody (green) was Alexa Fluor® 488 goat anti-rabbit IgG (H+L) used at a 1/1000 dilution for 1h. Alexa Fluor® 594 WGA was used to label plasma membranes (red). DAPI was used to stain the cell nuclei (blue). ab45317 has not yet been referenced specifically in any publications. Publishing research using ab45317? Please let us know so that we can cite the reference in this datasheet. There are currently no Customer reviews or Questions for ab45317.